Researchers discover previously unseen regulatory network in the kidney. The kidney carries out vital functions by continuously filtering the blood and excreting waste products into the urine. This is achieved by a complex system of tubules which transports the urine and regulates its composition. Now, a team of researchers from the Max Delbrück Center (MDC) have now discovered how parts of these kidney tubules establish an inner space (lumen) and form a tight barrier against adjacent structures. The epithelial cells which line the tubules coordinate these processes through a novel molecular signaling pathway. The study is published in the Journal of the American Society of Nephrology. The starting point of the researcher’s analyses was the transcription factor grainyhead-like 2 (Grhl2). As the research group discovered a few years ago, Grhl2 regulates the formation and structural integrity of epithelial cells lining the inner and outer surfaces of the body. Now, the researchers have shown that this gene regulator also plays a role in the kidney. The current study revealed that Grhl2 is primarily expressed in the renal collecting duct and in its embryonic precursors, the nephric duct and the ureteric bud. The collecting ducts form particularly tight, impermeable segments of the nephron, which is the basic structural unit of the kidney. The team explain that the kidney filters around 1700 liters of blood every day, producing about 180 liters of primary urine. However, after passing through the tubular system only one to two liters of urine are excreted, while the remaining vital components are reabsorbed. The collecting ducts carry out the fine-tuning of the urinary composition, thereby ensuring life-sustaining processes like blood pressure regulation and body water homeostasis. To determine the function of the Grhl2 transcription factor in the kidney, the researchers investigated cell cultures of collecting duct cells and nephric ducts of mouse embryos deficient for this factor. The result: If Grhl2 is missing, the barrier function of these epithelial cells is significantly reduced and lumen expansion is defective. Furthermore, the researchers found that the transcription factor Grhl2 does not work alone. It teams up with and regulates another transcription factor, ovo-like 2 (Ovol2). This tandem controls a gene that is important for the sealing of epithelial cell clusters (claudin 4), thus ensuring an impermeable barrier, as well as another gene (Rab 25), which controls cellular trafficking of constituents between the cell and the internal environment of the lumen. Hence, the researchers could elucidate a novel molecular signaling pathway in the kidney. The team state that barrier formation and lumen expansion are essential components for normal kidney development and function. However, they also participate in kidney pathology, such as cystic kidney diseases, which lead to an uncontrolled expansion of the tubular lumen. The team are now planning to expand on this research. Kidney of a mouse embryo. 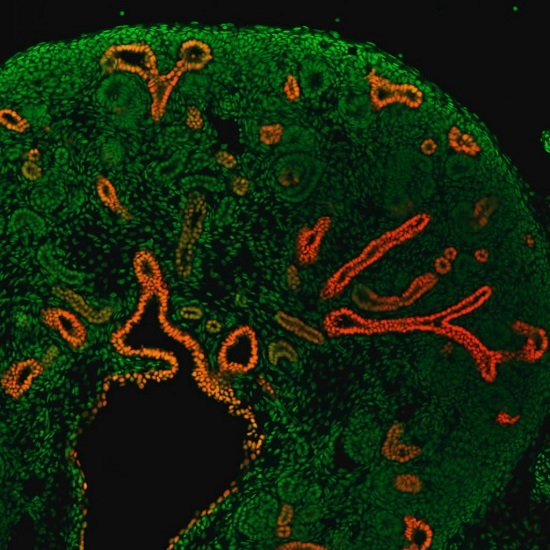 The cell nuclei are stained green, the transcription factor Grhl2 red. Photo: Katharina Walentin/ Copyright: MDC.